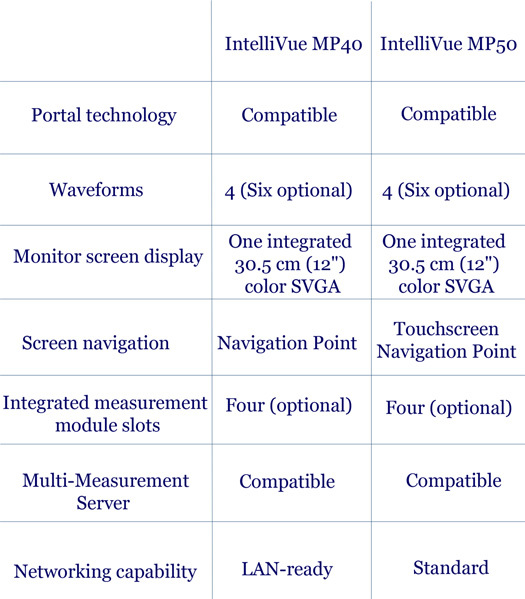 Portable patient monitoring and clinical analysis - connected IntelliVue MP40 and MP50 patient monitors combine portability and measurement flexibility to match the pace and unique needs of intermediate care environments at the patient side. * 30.5cm (12") color SVGA monitor display with 4 or 6 waveforms is bright and easy to read. * 5-hour battery life** means the MP50 is convenient to use for in-hospital transfer. * IntelliVue comes with 10 preset screen configurations. * Customized viewing options let you view and analyze data in graphical or numerical formats, juxtapose real-time measurements and trended data, and organize every onscreen element from waveforms to data labels as desired. * Access information from a variety of systems on the hospital network pharmacy, laboratory, ECG management systems, radiology PACS, host based hospital systems and others and deliver it to the patient monitor through IntelliVue portal technology.